Be the first to share your favorite memory, photo or story of Chester. This memorial page is dedicated for family, friends and future generations to celebrate the life of their loved one. 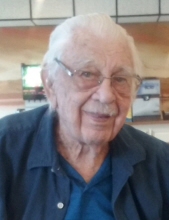 Chester A. Grimm, 98 year old resident of Tahlequah, OK passed away February 16, 2019 in Vinita, OK. He was born on July 27, 1920 in Wabaunsee County, KS to Clarence and Minnie (Russell) Grimm. Chester is preceded by his parents and his wife, Ruth (Pape) Grimm in 1994. Chester lived his early years in rural Kansas. Initially the family lived at Elmont, KS, where he started school. In 1929, they relocated to a farm near Fall River, KS, where Chester grew to maturity. As the oldest of three children, he helped his father with farm work. To provide a cash income in the winter he cut stove wood for $1.00-$1.50 a rick and in the summer worked at neighboring farms. Early in his life Chester displayed a mechanical adeptness. In the summer of 1936, he salvaged auto parts from a variety of makes and models and built his own car. This vehicle served as the “school bus” for students, including his future wife, in his rural neighborhood until Chester graduated from high school. In the spring of 1939, Chester graduated from Fall River High School, and the following fall enrolled at Kansas State Teachers College, Pittsburg, now Pittsburg State University. He majored in industrial education. World War II interrupted his studies. In the summer of 1942, Chester was drafted in the U.S. Army Air Force. He received training as an engineer and was assigned to the 851st Battalion, Air Force Engineers. His unit went to England where Chester supervised a crew who repaired bomb damaged runways and built roads. Following D-Day, the 851st went to France. Chester and his fellow engineers followed the war across France and into Germany. When the fighting ended, his unit was at Hanau, Germany. Following an honorable discharge from the Army Air Force, Chester returned to the farm at Fall River. There he reacquainted himself with Ruth Pape, now a teacher at the nearby one-room school. On August 18, 1946, they married. During the following three years Allen and Les were born. They moved to Pittsburg, and he resumed his college work. As an industrial education student, he became an accomplished furniture maker and while pursuing a master’s degree taught undergraduate classes. He completed both the Bachelor of Science and Master of Science degrees in Industrial Education. In 1952, Chester accepted a position as Professor of Industrial Education at Northern Oklahoma College, Tonkawa, OK. For thirty years he taught numerous classes including welding, machine shop, and auto mechanics. As important as his profession, Chester dedicated much time to his church. He served as a deacon at Tonkawa Assembly of God Church for 3 decades and as Sunday School Superintendent for 25 years. Two of his favorite church activities were the annual Buddy Barrel Campaign, a children and youth program to raise money for missions, and Vacation Bible School. At vacation Bible school he provided rides for the children, making a battery powered car and an air propelled rocket. Throughout this time, Chester was a devoted father. DeAnne and Mariam were born in Tonkawa. Ruth and Chester emphasized the importance of Christian faith, community service, and education. He served as leader of the Royal Rangers, a boys Christian organization. He was an assistant Cub Scout leader and for many years was active in the Tonkawa Kiwanis Club. All of their children graduated from high school, college, and some obtained advanced degrees. Travel became an important part of family life. Spring breaks and summers the family camped a lakes and parks in Oklahoma and Texas. In addition, they traveled to Idaho to visit Ruth’s family and to enjoy the mountains at Cascade. During the late 1960s and early 1970s, Chester and family spent summers at the University of Northern Colorado, Greeley, CO where he completed an Educational Specialist Degree in Industrial Education. This opportunity provided more adventures in the Rocky Mountains. In the spring of 1982, Chester retired from Northern Oklahoma College. He remained active in the First Assembly of God Church, but Ruth and he expanded their travel. From May to October they stayed at an RV resort at Cascade along the North Fork of the Payette River. Chester and his brother-in-law fished, Ruth and he explored old mining towns, visited antique markets, and hosted the families of their sons and daughters. At Cascade, Chester acquired the skills and demonstrated the talents of a master carver. Each summer he worked on a project, often depicting horse drawn farm machinery. He won many awards at county fairs. These works of folk art became prized possessions of his family. In 1998, Chester moved to Tahlequah, OK, to be closer to Mariam’s family. He became the quintessential grandfather for Mariam’s boys, Ben and Bradley. He continued his church work and built a shop in the backyard of the Corbett home. Each summer he departed for Idaho and the mountains. When in Tahlequah, he worked full time as a volunteer at the Murrell Home State Historic Site. For ten years Chester restored historic outbuildings, repaired furniture original to the house, and spoke to students about farm life. Because of Chester’s talents and contributions to the Murrell Home, specifically for the he money he saved the historical society, he received a plaque and congratulations on the floor of the Oklahoma State Senate. The incremental losses of sight and hearing required Chester to move to a retirement facility. He continued to carve and work in his shop. Two years ago he entered an assisted living center as his health continued to decline. On Saturday morning, February 16, 2109, Chester died peacefully in his sleep. Chester leaves behind two daughters Mariam Corbett and husband Bill of Vinita, OK, and DeAnne Wall and husband Jimmie of Burleson, TX and two sons Les Grimm and wife Lou of Tonkawa, OK, and Allen Grimm and wife Bev of North Newton, KS. Chester has 8 grandchildren and 18 great grandchildren. He is also survived by one brother Ed Grimm and wife Edith of Leavenworth, KS and one sister Jean Hinton and husband Jerry of Topeka, KS, as well as numerous nieces, nephews, relatives, and friends. Public viewing will be from 2-4 and 6-8 PM, on Thursday, February 21 at Burckhalter-Highsmith Funeral Home, Vinita. The Celebration of Life will be at 2 PM - Saturday, February 23, 2019, at Mercer Funeral Home, Holton, KS. Honorary pallbearers are Ben and Bradley Corbett, Wade and Kyle Grimm, Angela Pulaski and Caressa Nusz, and Anne Harvey and Sara Beth Hodges. In lieu of flowers, the family requests memorial donations to the Friends of the Murrell Home, 19479 East Murrell Home Road, Park Hill, OK 74451. Arrangements are by the Burckhalter-Highsmith Funeral and Cremation Services of Vinita. Online condolences may be made at www.highsmithfh.com or on our Facebook page. To send flowers or a remembrance gift to the family of Chester A. Grimm, please visit our Tribute Store. "Email Address" would like to share the life celebration of Chester A. Grimm. Click on the "link" to go to share a favorite memory or leave a condolence message for the family.